I feel that my eyes have been opened by The Medici Conspiracy. But surely I should be familiar enough with the world of antiquities not to be shocked? "However bad you feared it would be [so far as antiquities looting and smuggling are concerned], it always turns out worse" (quoted in the Medici Conspiracy, p. 310). 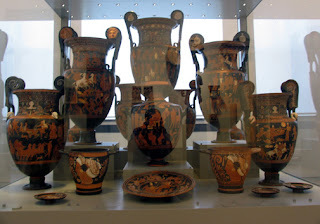 It was coming face to face in the Altes Museum in Berlin with a massive display case positively groaning under ranks of Apulian pottery from a single grave. a. Seven massive volute-kraters (three attributed to the Darius painter: 1984.39, 40, 41) - but only the foot of a eighth. Many of the pots fall into distinct workshop groups and share the same attributed "hands" (e.g. Group of Copenhagen 4223, Varrese painter, Underworld painter). This is a common feature of tomb-groups. All the pots seem to have been broken into fragments and carefully restored. Had the tomb collapsed and every single pot been broken into Jiffy-bag sized pieces? The helpful museum labelling hints that the cemeteries of Taranto had been destroyed by modern construction. Perhaps the museum was giving these dispossessed orfani a home. So how did these Apulian pots end up in Berlin? Who handled the transaction? What was their route? The Medici Conspiracy mentions the Berlin material in passing (p. 109). The source seems to have been Giacomo Medici as Polaroids showing the objects were found in Geneva. "The third acquisition was the most important and took place in 1983 [the accession was in 1984]. This involved a group of twenty-one Apulian vases all coming from the same tomb. The photographs in Medici's warehouse didn't show all the vases, however, but just four of them in fragments, lying on the floor. In this case there were three series of Polaroids---one of fifteen photographs, another of six, and a third of two---that show the vases in various stages of restoration, the most important of which was a krater by the Darius Painter" (p. 361 n. 2). "All twenty-one had been offered to Berlin by one Christoph Leon of Basel on behalf of a Basel family, the Cramers. Professor [Wolf-Dieter] Heilmeyer examined the vases on the premises of the director of the Museum of Art and History of Geneva, Jacques Chamay ... Heilmeyer had spoken to the person who declared she had restored the vases, Fiorella Cottier-Angeli, who told him that the vases had been in very old chests and had reached Geneva "in the nineteenth century" ... the overall price of 3 million marks had been paid to Leon" (p. 199). d. Malibu 87.AE.23 (pelike) [to be returned to Italy]. The irony is that Berlin's "Museum Island" (Museumsinsel) has been granted UNESCO Cultural Status and Protection - to display what appears to be cultural material looted from an undocumented archaeological site. Is there any documented evidence that this "grave group" was known prior to Heilmeyer's inspection of the material in Geneva? What is known about the Cramers of Basel? Why would Giacomo Medici have Polaroids of fragmentary pots which had reached Geneva in the nineteenth century? Has the history of the group been fabricated? Should the pots be taken off display? When will the group be returned to Italy? Or is there an innocent explanation?